The stage is set for a big home-and-home series between the two Hockey East squads. The Eagles, after dropping games to New Hampshire and Syracuse in the past couple of weeks, can’t afford another loss right now. They’ve got to get back on the right track at some point and string together some dominant performances, especially on defense. This weekend is a good opportunity for Boston College to do that, but the Friars’ offense could prove to be a lot for them to handle. Although they’ve got the firepower up front to outscore Providence, the Eagles really need a good showing on the defensive side of the puck for a full 60 minutes in both games. Providence has gone back and forth with every team they’ve played this year, splitting all four of their series so far. While I wouldn’t expect a sweep for the Friars, if they can come out of this weekend and still have a .500 record it’ll be good for them, especially confidence-wise. Providence’s top-six has proven to be really strong at times, and they’ve got a decent chance here against Boston College if they’re at their best. 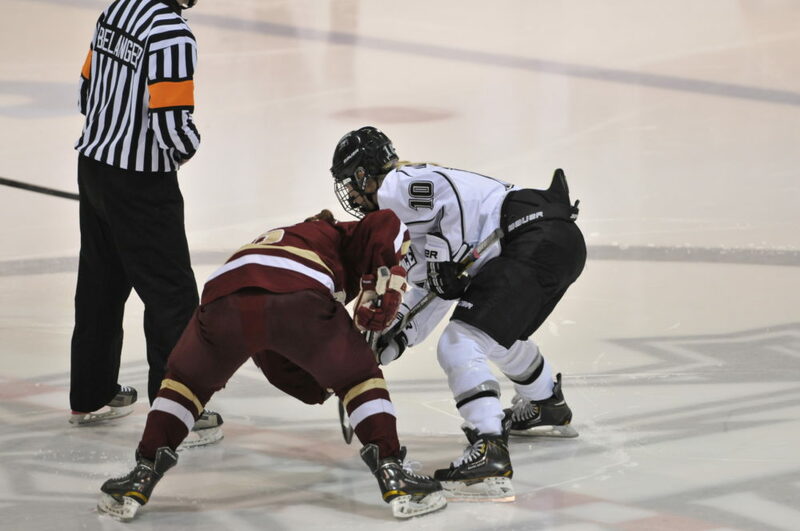 They’re going to need players like Rebecca Morse and Maggie Pendleton to step up on the back-end, however, to try and limit the Eagles’ attack, and Sarah Bryant will also have to be ready in net. North Dakota continues its road trip against Bemidji State this weekend. They’ve been playing well this season, but they’ll be missing top forwards Michelle Karvinen and Susanna Tapani, who are preparing for the Four Nations Tournament with the Finnish national team. And Bemidji is not a team that UND will want to overlook. The Beavers gave Minnesota everything they had last weekend and pushed the Gophers to the brink but came up short, losing 4-3. This might not seem like the biggest series in the world, but it’s a good mental test for North Dakota; it’s important for them to come into the weekend focused and ready. Red-hot Cornell will visit Princeton and Quinnipiac, and I think both will provide some solid competition, especially the Bobcats. The Tigers put up 44 shots last week against Harvard, so they’ve definitely got some fight in them, but the Big Red haven’t had any problems scoring so far this year and that will probably continue here. They’ll have to be careful against Quinnipiac, however; the Bobcats have a few different players who can put the puck in the net, and Kelly Babstock is the kind of player who can totally change a game, so Cornell will want to make sure they’re prepared defensively. Ohio State visits Wisconsin this weekend in a very intriguing WCHA match-up. The Buckeyes have already upset North Dakota this year, so the Badgers will want to be ready for a competitive series. What really makes Ohio State so dangerous are their special teams. With Sara and Kari Schmitt running things on the blue line, they’ve got an effective power play and penalty kill, which are very often the difference in close games. Wisconsin has done well offensively except against Minnesota, but besides the Gophers, they haven’t played particularly challenging competition. Ohio State, though, is a quality team, so it’ll be interesting to see if the Badgers can find ways to produce against them. Boston University has a pretty big week coming up, with three games between now and Wednesday. Their games against New Hampshire and Vermont will, I think, be the real hurdles for them. The Wildcats are exceeding expectations so far and have already beaten Boston College; with Vilma Vaattovaara in net it could be extremely difficult for the Terriers to score. And if the Catamounts can also get good goaltending they’ve got a solid chance at an upset, too. The main reason why Boston University has to be careful with both of these teams because they can match the Terriers’ depth up front if they play well enough, and with the players BU has had in recent years, they’re not exactly used to that.